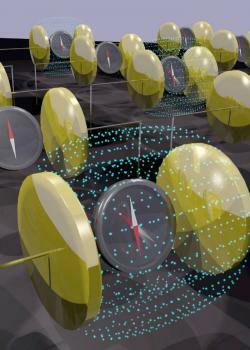 Researchers from the U.S. Department of Energy (DOE)’s Lawrence Berkeley National Laboratory (Berkeley Lab) and Cornell University managed to use an electric field to reverse the magnetization direction in a multiferroic spintronic device at room temperature. The researchers showed that 180-degree magnetization switching in the multiferroic bismuth ferrite can be achieved at room temperature with an external electric field when the kinetics of the switching involves a two-step process. They say that this demonstration, which runs counter to conventional scientific wisdom, points a new way towards spintronics applications. What will follow the silicon chip?